When you need to field-punch & dimple a frame, you know what a time consuming mess the old "ball peen hammer" method can be. Bowed frames and fasteners sticking out scream "poor installation" to your customer. The Framon DT-1 Frame Dimpling tool makes your installations look professional, but the biggest plus is the time it saves. Once you drill the holes, simply place the DT-1 on the inside of the frame and screw the hardened allen screw into the tool. The angled screw head leaves a perfect dimple every time. As shown above, the tool comes with an allen wrench, but make the job even quicker by using an impact drill to drive the screw in. Using an impact drill, a frame with six dimples can be finished in about 90 seconds. 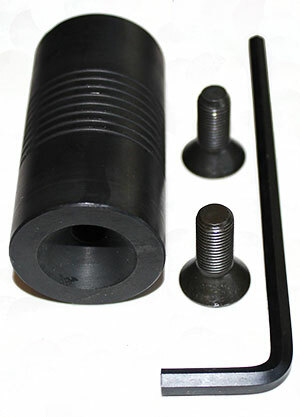 This tool is hardened, and uses standard 3/8-24 x 1" screws, that are not hardened, so they wear out, and not your tool.